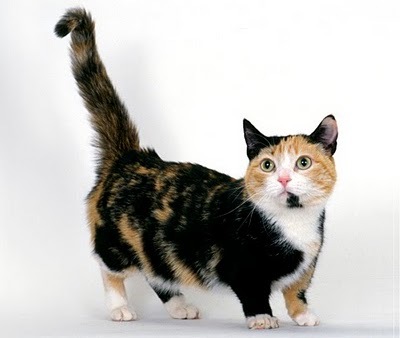 The Munchkin breed is a relatively new breed of cat (first introduced to the public in 1991) that is characterized by its very short legs. In 1983, a music teacher in Louisiana found two pregnant cats hiding under a truck. She kept one of the cats and named her Blackberry. Half of Blackberry’s kittens were born short-legged. The music teacher gave a short-legged male kitten from the litter to her friend, who named that kitten Toulouse. It is from Blackberry and Toulouse that today’s Munchkin breed is descended. The Munchkin is generally a small to medium-sized cat with a moderate body type and medium-plush coat. Male Munchkins usually weigh between 6 to 9 pounds, and are larger than the females, who weigh between 4 to 8 pounds. The hind legs are slightly longer than the front which creates a rise from shoulder to rump. The legs of the Munchkin are often times slightly bowed. The Munchkin comes in all coat colors and patterns. There are two separate categories: long-hair and short-hair. The short-haired variety has a medium-plush coat while the long-haired variety has a semi-long silky coat. The Munchkin is generally described as sweet-natured, playful, outgoing and intelligent. They are very people-oriented and respond well to being handled. They enjoy games that involve a lot of running and chasing, which may seem surprising to some. However, their short legs in no way interfere with their running and leaping abilities. Munchkins generally love children and other pets – even dogs. They are curious and will investigate anything and everything. Though their short legs will prevent them from jumping up on high places, their overall mobility is not hindered at all. Many owners of this breed liken them to having a ferret as their “off” button for high-energy play is hard to find. Munchkins are considered the Welsh corgi, the Dachshund, or the Basset Hound of cats. As interesting and adorable as they may be, it can be hard to breed them. The Munchkin gene is an autosomal dominant one. Presently, no Munchkin kitten has been shown to carry the gene from each parent. Litters born to a Munchkin and a non-Munchkin cat have “normal” kittens or Munchkins. There has been some controversy concerning this breed when critics voiced concerns over potential health and mobility issues. Groups argue that it is against the very nature of cats not to be able to jump, climb and hunt and that it is outrageous to breed a cat against the rules of nature. There have been reports that they can suffer later in life with problems with their spines and joints. This fear, however, was put to rest in 1995 when many breeders examined their Munchkin’s for spinal problems and they were all found healthy. The only practical risk of a Munchkin cat is that if they are outside it wouldn’t be easy for them to escape a predator because of their little legs. So, to keep Munchkin cats safe, they should be kept indoors more.